The annual Tree Lighting Ceremony returned to City Hall November 29th, with glistening lights, yummy hot chocolate and festive carols. 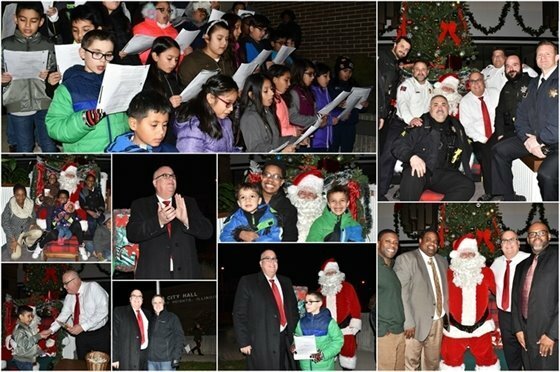 Mayor Gonzalez opened the chilly evening with a warm welcoming address marking the beginning of the holiday season in Chicago Heights. The District 170 Choir began the evening with a selection of festive tunes, followed by the St. Agnes Children's Choir, who continued the holiday soundtrack with more rhythmic melodies. Following the children's choirs, amidst blaring sirens and flashing lights, CHFD elves delivered Santa Claus to the front of City Hall by firetruck! Santa joined Mayor Gonzalez and his helper, Charlie Lungaro, from the St. Agnes choir as they flipped the switch, illuminating City Hall with beautiful lights. The Bloom District 206 Choir sang in beautiful harmony with the lights twinkling behind them. Following the tree lighting, families were treated to refreshments inside City Hall. Along with hot chocolate and treats, Santa took pictures with children and spent some time chatting with them about their wish lists! “The Tree Lighting Ceremony always puts you in the holiday spirit, and it's a wonderful way to start the holiday season,” said Mayor David A. Gonzalez. For more pictures of the merriment and melodies, click here.